On the evening of Sunday, March 9th 2008, thousands of worshippers gathered to fill the Acer Arena in Sydney as Hillsong Church recorded their latest live worship album. It was an unforgettable night-an encounter with God that left the thousands who filled the stadium humbled and in awe of the wonder and grace of God and the reality of Christ. The church was truly united in heart and passion - and the breadth of the Hillsong worship team was reflected as a number of new songwriters, worship leaders and musicians joined Darlene Zschech , Reuben Morgan, Joel Houston and Marty Sampson on the platform to capture the sound of the generations old and new together in worship and song. 'This is Our God', is the 17th Hillsong live praise and worship album. God Of This City features explosive live worship as performed by Chris Tomlin, David Crowder Band, Charlie Hall, Matt Redman, and other college-minded worship leaders. After a best-of and a break from annual releases in 2007, Passion is back with God of This City, the successful conference's tenth new album since its 1998 debut. It's also the first album recorded at more than one location-the annual big event in Atlanta, as well as brand-new regional events in Boston and Chicago. God of This City is a very good collection-an apt indicator of Passion's growth over the years, as well as a generous sampling of new songs of praise for churches worldwide. There is a new face of PARACHUTE BAND that carries on the passion to influence the next generation through worship music that is totally fresh and contagious. Five young musicians have been passed the mantle and an exciting synergy has quickly formed to create a new guitar-driven modern worship sound. All committed to their local churches and to honoring God in their lives and music, these guys are the new face and new aggressive sound of PARACHUTE. With 15 new songs, limitless energy and hearts that are all about the things of God, Parachute Band is poised to push boundaries and take their worship to a totally fresh space. Having already performed in Australia and New Zealand this year, the band has toured the U.S., Canada and the Philippines including main stage slots at Creation Festival and Kingdom Bound Festival. Mighty To Save is the 15th live worship album to come out of Hillsong Church recorded on March 5th, 2006 and led by Darlene Zschech and the Hillsong team. Over 10,000 worshippers at the Sydney Entertainment Centre sang, danced and worshipped their God wholeheartedly and without reserve. The presence of God was powerfully evident throughout the night as His name was lifted on high. These new songs are infused with life, energy and a heartfelt adoration for our Saviour. Our prayer is that you would be inspired to worship in spirit and truth as the message of God's unfailing love and power is declared through these songs. Before Israel Houghton and Chris Tomlin, there was Tommy Walker, a worship leader for 15 years with several songs on the CCLI chart including "Mourning Into Dancing" and "He Knows My Name." Tommy Walker's 2008 release for Maranatha! Music captures the essence of contemporary and modern worship with accessible, moving melodies and fresh expressions of timeless faith. Includes "Speak To Me," "Pass It On," "Holy Spirit Come," and more. From Rwanda to Capetown, Buenos Aires to Mexico City, Los Angeles to Toronto, London to Budapest... Shanghai to Sydney, Hillsong United recorded almost their every United worship service for the last 2 years. Bottled just some of the moments and put them together for all who'd choose to hear. The end result is the sound of a generation across the earth singing praise and worship to our God. It is the first part of a three part release. It's a cover-version collection of the most sought-after Easter classics like Take Me To The Cross, Via Dolorosa, At The Foot Of The Cross, No Greater Love and more! There are 16 cover versions with fresh new arrangements. The CD is priced at only P300.00. The Ultimate Praise Collection Volume 2 Duets is a compilation of some of the timeless praise and worship songs which became staples in church repertoires worldwide performed in duets. There were popularized by world renowned Christian music Twila Paris, Ron Kenoly. Stuart Townend and more. This CD lite is complete with lyrics and minus ones. This CD lite has 14 tracks (7 with vocals & 7 minus ones) and complete with lyrics. It is highly recommended for church music or choir directors especially for duet acts-a complete and affordable music resource. The album is budget friendly for only P150.00. Live To Worship 3 is the latest addition to the Live To Worship series featuring 28 tracks of today's greatest worship songs that are all original recordings from your favorite artists. This series has proved extremely popular with its fan base since LTW 1 and no wonder - with top songs like "Happy Day" (Tim Hughes), "I Can Only Imagine" (Mercy Me), "Saviour King", "Mighty To Save" (Hillsong), "Miracle Maker" (Delirious) and "Love Divine" (Vineyard), it's a great way to get the best songs of the moment at a fantastic price of P550. Some of the most popular new worship songs recorded without the big production. Inspired Acoustic is about stripped-down, 'unplugged' arrangements that are not only great to chill-out to, but are also a really big help to small group worship leaders. This is a delightful collection of reflective worship songs that would benefit small groups and personal quiet times throughout the land. The Ultimate Praise Collection is a compilation of some of the timeless praise and worship songs which became staples in church repertoires worldwide. There were popularized by world renowned Christian music icons like Don Moen, Darlene Zschech, Geoff Bullock, Matt Redman and more! This CD lite is complete with lyrics and minus ones. This CD lite has 14 tracks (7 with vocals and 7 minus ones) and complete with lyrics. It is highly recommended for churches' music or choir directors and even soloists as a complete and affordable music resource for only P150.00. For the first time ever in the history of WOW, the biggest artists in Christian music perform their favourite classic or modern hymns. 2 CD set contains 5 brand new songs not available anywhere else - Come Thou Fount Of Every Blessing by Mark Schultz, Grace Greater Than Our Sin by Building 429, I Surrender All by Brian Littrell, All Hail The Power Of Jesus' Name by Point Of Grace and Tis So Sweet To Trust In Jesus by Casting Crowns. The WOW brand has sales of more than 15 million units, including 4 Double Platinum, 18 Platinum and 10 Gold albums in apition to 2 Gold selling videos. 18 of today's best known worship songs for only P300.00! This amazing quality album is a perfect blend of today's best-known worship songs available at an affordable price. The first studio album from Matt Redman since 'Where Angels Fear To Tread' (2002), offers an excellent collection of modern anthems for the church. 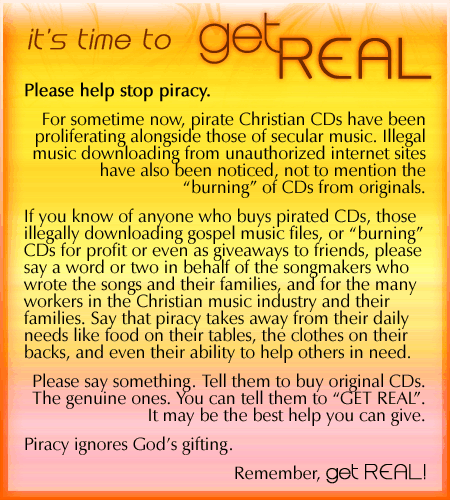 Including songs You Never Let Go, Shine, Beautiful News, Greater Song, and Take It To The Streets. Matt Redman has become one of the leading songwriters of the contemporary worship movement. He has recorded 8 albums and seen many of his songs become classic worship songs, such as, 'The Heart of Worship', 'Once Again', 'Let Everything That has Breath' and 'Blessed Be Your Name'. His songs have become a worship resource for churches all over the world. Reuben Morgan - one of this generation's most gifted worship leaders and songwriters - is lining up his next release, EVERYONE. And, as the title suggests, the album marks a return to the Australian's primary passion...congregational worship. Having led worship at numerous events worldwide, Reuben's blend of intimacy and interaction is clearly going down well with, well, everyone. The album contains the new track Mighty To Save and the coming soon-to-a-radio-near-you single, All For You. Also included are some of his best-known classics that fans worldwide have requested, notably Eagle's Wings and Still. And with the enhanced features on the CD, lead sheets and lyrics are just a click away. See the Morning is an album that was released on September 26, 2006 by Chris Tomlin. The title comes from that fact that "Our God is as faithful as the rising sun" and is the "Light of the World". The first single from this recording was "Made to Worship", which was first heard as an iTunes bonus track for the Passion album Everything Glorious. See the Morning debuted at No. 15 on the Billboard 200, Chris' highest debut on the chart. Combined with a #1 debuted on the SoundScan compiled Current Contemporary Christian, Christian Retail and Billboard Christian Album sales charts with 47,420 units sold, the CD experienced a 113% sales leap over Arriving's first-week numbers (that album went on to be Gold-certified). Provident and Integrity are proud to bring you the Platinum Series. Platinum Series titles bring you 10 of the most loved songs from top selling artists. All original songs by original artists. Built on a platform of songs to make the name of Jesus renown around the world, Passion puts together the definitive collection of songs from the movement over the last ten years. A 2 CD set with 25 of the best songs from Passion, including 5 Passion songs never before released on CD. The Hillsong United praise and worship team are returning in 2007 with the eagerly-awaited new studio album, All Of The Above - the first of a 3-part global project. You can look forward to 14 fresh songs that consist of raw passion straight from the hearts of young people who exist to stir up a generation both locally and globally to live and stand for the hope and salvation found in Jesus Christ. Available March 2007, All Of The Above comes with a bonus DVD, which includes 3 songs recorded live at Encounterfest in October. It also contains a message from Phil Dooley, a promo of I Heart Revolution, a promo of our under 21s project, some video blogs and a 7-10 minute interview with youth leaders talking about youth ministry. This double CD gets it right again: with established names sitting alongside well-known church worship songs. With all tracks being original recordings, Live To Worship 2 represents something that is truly worth getting excited about. It does to excuse the cliche, exactly what it says on the tin. It's one great double album for only P550.00! Celebrate Christmas with Darlene Zschech and the Hillsong team, with this beautiful Christmas album. You will love the diverse songs on this stunning album, featuring a rich array of sounds from 'big band' to traditional carols." - Hillsong with special guest James Morrison, this album will bring in the Christmas season in style. Album also includes a bonus CD-ROM. Leigh's debut album combines the freshness of a songwriter realizing his immense potential, with a maturity and focus that belies his fledgling recording career. Here are songs about intimacy and grace, revelation and love that flood the heart and leave the listener gazing skywards in simple awe. It's been 15 years since the original First Call's last album. Finally, Rejoice reunites the original First Call members Marty McCall, Bonnie Keen and Melodie Tunney! Now, they bring you their unique vocal stylings and award-winning sound in a collection of favorite hymns like "The Solid Rock," "Come Thou Fount of Every Blessing," and the title song, "Rejoice!" With fresh arrangements that cast a new and energetic light on music sure to make yesterday's favorites come alive for the next generation. Groundbreaking technology brings together both audio and visual on this fantastic resource for Small Group Meetings. There are 3 sets of 5 songs suitably recorded for small group worship. The DVD contains the same audio along with your choice of words, visual and liturgy. Songs Of Fellowship - bringing the church into your home! TOUCH THE PHILIPPINES Timeless Hits features world renowned songwriter/singer/worship leader Steve Kuban's greatest hits from his multi-awarded albums PLUS the carrier track "Touch The Philippines", a very special song-prayer he purposely wrote for the Philippines. The song cries out for the Father's intercession in the process of reconciliation, healing and nation building. A veteran Christian artist whose career spans over two decades. His songs have been recorded by Sandi Patti, Amy Grant, Bruce Carroll, Pat Boone, The Imperials, Petra and international opera star Placido Domingo. Presently serves as the worship and missions pastor at North Coast Presbyterian Church and continues his theological studies at Westminster Seminary. With influences like Keith Green, U2, Rita Springer and David Ruis, Jason Morant brings an eclectic, edgy mix of styles and textures to his sound. It is the uniqueness of that sound combined with the maturity of his lyrics that is captured on Abandon. Best known as the worship leader for the Beth Moore Conferences, Travis Cottrell has mastered the ability to reach the wide diversity of worshipers in the Church today. Now experience this powerful ministry in 14 newly recorded songs. From the simplicity of acoustic worship to the rich texture of a full choir, Alive! Forever is designed to blend modern and traditional worship styles for an expression that is relevant to all generations. All For Jesus combines passionate songs of worship with a second CD of inspirational spoken word clips. Taking the central theme of Passion and Commitment, the music album will appeal to fans of worship songs with an awe-inspiring message and powerful musical arrangements. The second CD features extracts from ICC's Spreading The Word audio-teaching range, delivered over a sweeping instrumental background from David Fitzgerald. With impassioned messages from some of the world's most fervent Bible expositors and speakers, this is a challenging and inspirational listening experience. "All The Earth" was recorded live at the 2005 Parachute Festival in New Zealand with over 24,000 people in attendance. There is a one-word description of this 13 track CD, the word "accessible". Every song is very congregation-friendly and the arrangements are, for the most part, simple. All The Earth delivers one of today's most powerful worship experiences. Featuring songs like "All the Earth", "To Live is Christ", "Everything that Has Breath" and "Shout." A collection of songs embracing the theme in Isaiah 40:3-5...'In the desert prepare the way for the Lord; make straight in the wilderness a highway for our God... The all new recording captures a fresh stripped down acoustic rock style paired with soaring melodies grounded in lyrics focused on the richness and glory of our Creator. Battle Cry: Worship From The Frontlines by Michael Gungor - Recorded LIVE in one momentous night of worship, Michael Gungor and band along with the students of Teen Mania Ministries joined together in Lyndale, TX. Featuring performances of some of the fastest rising worship songs "You Are Good", "Rescue" and "I Am Free", Battle Cry: Worship From The Frontlines represents powerful and engaging worship songs from the upcoming Fall '05 - Spring '06 "Acquire The Fire Battle Cry" Conference events. Focusing on a life that is completely reliant upon Him, this collection includes some of today's popular modern worship songs in a style that is relevant to the traditional church. In this follow-up to their live recording, Zoe Group continues to offer today's compelling songs in a format to resource churches with a more traditional focus or those with a desire to blend together their powerful modern worship with the beauty and simplicity of acappella music. Misty's best-selling first recording, Eternity captures the heart of the extravagant worshipper! Misty Edwards is one of the International House of Prayers most beloved worship leaders. Her unique gifting draws your heart before the Lord, our Majesty into a deep realm of intimacy with Him. Intensity and passion best describe this album. It has substance that is worthy of your time. Misty, who wrote most of the songs, obviously has a deep, meaningful relationship with the Lord. The album features the songs "Glance", "Break the Chains" and "Let Me Love You More" and more! Inspired by My Utmost For His Highest, Everything Counts is a years worth of devotions adapted for students published by Youth Specialties and Zondervan Publishing. Now, Vertical Music (Integrity Music) has created a companion worship project, Everything Counts - Worship Songs For Radical Living. Features top worship leaders: SONICFLOOd, Tree63, Top Agnew, Big Dapy Weave, By The Tree, Lincoln Brewster and more! A new approach to traditional hardbound songbooks which assists worship leaders, vocalists and musicians in mastering new songs and leading others in worship. Rising up from the heart of Dublin comes the raw and passionate sound of worship from the Inner City Church. Recorded live at Core Church, Grace In The Wilderness features Eoghan Heaslip, one of today's foremost songwriters and worship leaders for the emerging generation in Europe. Worship Together continues the tradition of being on the forefront of breaking new worship songs for the church and beyond with the second volume of the powerful series - Here I Am To Worship 2. This two CD compilation features not only the top worship songs being sung in churches all across the country but introduces many brand new songs; Filled With Your Glory - Starfield, Rain Down - Delirious, Spirit Waltz - Something Like Silas and many more! Does your family Worship Together? Capture the power of today's beloved worship songs delivered with an energetic sound and heartfelt passion - Just for kids! Worship Together delivers a second collection of 10 top worship songs with Here I Am To Worship For Kids 2. This unique worship soundtrack is recorded with young voices to appeal to young ears aged 6-11. Here I Am To Worship For Kids 2 features songs that are sung in churches all across the world and are sure to be new favorites for all young listeners. Integrity's iWorship No Boundaries (Various Artists) is an incredible 2 CD collection of 33 top worship songs by some of the biggest artists including 14 Dove Award winners. It is the perfect combination of the different worship styles that make up the worship movement exploding across the world today. Live to Worship - a 28 track double CD adventure through the wild uplands and fertile planes of contemporary Christian worship. Live To Worship draws on the life-blood currently coursing through the veins of churches from both sides of the Atlantic as well as both hemispheres. Live To Worship's strength lies in its honest reflection of the current state of play within the Christian scene. Songs of justice stand tall - Reuben Morgan's 'World Through Your Eyes', Matt Redman and Graham Kendrick's 'To You O Lord'. Then there are the songs of passion - 'Rain Down' by Delirious, Matt Redman's 'Praise Awaits You'. But above all, Live To Worship plugs into a full scale sense of dedication to the restless pursuit of God's call. Tim Hughes is there with 'You', The Newsboys have 'Presence (My Heart's Desire)' and Delirious' 'Majesty' is the perfect accompaniment to the Vineyard classic (reworked by Jason Morant in a Coldplay state of mind) 'I Love You Lord'. Thought you've already heard all there is to hear when it comes to today's praise and worship? If so hold on! Wait a minute! It is time to experience the vibrant new sounds of AGAPE Christian Centre's Radical Devotion! You are sure to be drawn into a whole new dimension of musical intimacy with Jesus as you let your spirit soar with such songs as Fixed on You, Jesus My Great Love and the title song, Radical Devotion. These songs are loved by the AGAPE congregation. Now, here in AGAPE Christian Centre's debut album, they are available as a great worship tool for local churches everywhere! Time-honored hymns such as Blessed Assurance, Stand Up Stand Up For Jesus, Dear Lord And Father Of Mankind, On A Hill Far Away (The Old Rugged Cross) and more performed with fresh arrangements and all the feel and atmosphere of the Spring Harvest Big-Top. Designed to offer a fresh look at traditional hymns, using live instrumentation to bring alive this rich heritage of hymns. Enjoy this exciting audio-video anthology of Steve's live teachings and worship videos, which features many of his songs and excerpts from his jam-packed concerts in the Philippines and India. It's definitely a 3-in-1 (songs, live concerts and teachings) must have VCD of the year! In a momentous night of worship, Delirious? joined Darlene Zschech and the Hillsong Team at the Hillsong Conference in the Sydney SuperDome. 20,000 uninhibited worshippers gathered to sing the best worship songs from both artists including the Hillsong classics I Give You My Heart and Worthy Is The Lamb and Delirious? hits Rain Down and Majesty. 2 Bonus Tracks : "My Glorious" and "More Than Life" - not included on the CD.